Just picture it—Havana in the 1920s. An exciting and imaginative setting for a party such as an engagement celebration that guests will be talking about long afterwards! The scene is pure vintage Cuba, reminiscent of the luxurious hacienda of a rich tobacco or sugar plantation owner. This ambiance of laid-back Latin elegance can be yours for the hosting. Simply take your cue from our complete arrangement of creative table settings and decor elements, exotic buffet menu and cocktails, and even party attire and music—all with a definite Cuban accent. So bring out the rum. It’s time to plan a Havana Night’s Party in a stylish way! *This post contains affiliate links. We’ve transformed a sunny veranda into a corner of a stylish hacienda! A chic color palette of aqua, browns, and greens is tempered by cool ivory and touches of orange, as references to sultry Havana keep the decor authentic but fun. Welcome guests to your own little hacienda! Set a party scene that’s casual yet elegant—decked out in a dressy palette of rich brown and beige, highlighted by vibrant aqua and touches of green and orange. For such a stylish summer event, it seems only right to request guests to come in fashionably casual attire. Get them all excited about planning what to wear by sending out invitations early, encouraging a “vintage Havana” dress code. The ladies can come in summery cocktail dresses, while the gentlemen can don cool linen guayaberas, plantation or tropical print shirts with collars, and smart fedoras. For attire ideas, please see Beach Grooms’ Attire: Cool Casual to Stylish Semi-formal. We assembled simple yet stylish place settings with clever cigar accents—boxes used as centerpiece “vases” and rolled up fabric napkins with a classic gold seal. 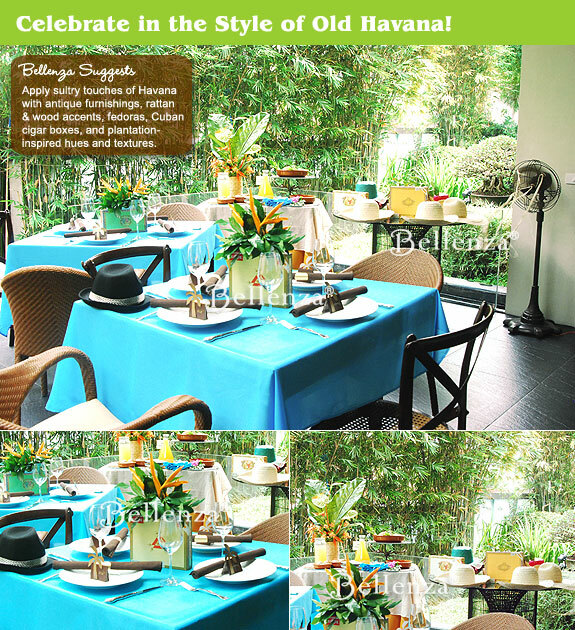 To suit this appealing scene, we crafted place settings that are surprisingly low-budget yet so cleverly theme-friendly. Old Cuban cigar boxes are used to hold the table centerpieces—each one filled with a simple arrangement of orange heliconias. 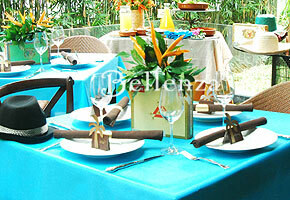 A dash of bright color amidst the table’s palette of aqua, brown, and green. Then, like each guest’s very own personal cigar, brown linen table napkins are rolled up into slim cylinders with gold circle cutouts serving as their “seals.” Matching these are place cards sporting whimsical palm tree cutouts also in gold, mimicking those that line the sandy beaches of the country of Cuba. Bring in a refreshing feminine touch with pretty bags filled with sweet or savory treats. Surprise guests with something special awaiting them right on their place settings. For the ladies, give treats that are nostalgic of old Havana such as sweet coconut candies, guava-flavored bon bons, Merenguitos (Cuban meringue cookies), or turrones. As for the men at the party, you can give out fedora hats propped on their chairs, personalized shot glasses, mini bottles of Cuban rum, and of course classic cigars! To see more favor related ideas: 8 Salsa and Hot Sauce Favor Ideas for Your Wedding . 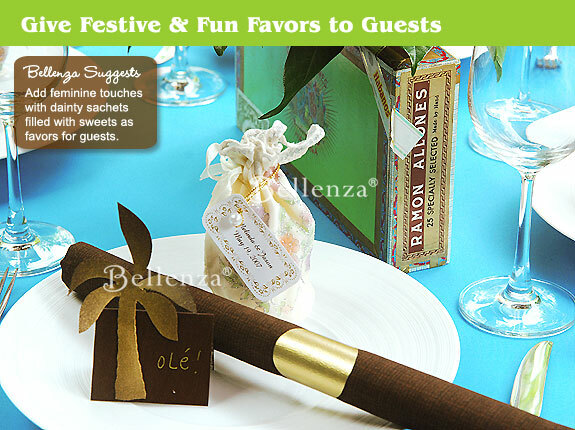 Other party favor ideas (*through our Amazon affiliate) you can consider would be chocolate cigars, powdered “mojito mixes” enclosed with a recipe card, novelty shot glasses decorated with the Cuban flag, or coasters with a vintage Cuban motif. Cuban music spans a wide range of influences from Europe to Africa. Cuban-style jazz, though, is just the thing to get everyone in the party mood. You may choose recordings by popular jazz artists Tito Puente, Alfredo Rodriguez, Pérez Prado, and Dizzy Gillespie. Or you could select from among the many CD compilations available that represent the Golden Age of Cuban jazz. Want a truly exciting spin on the festivities? Bring in a dance instructor, put on some bossa nova, samba, and mambo tunes, and guests will be dancing the night away! Mmmmojitos! The perfect summer cocktail for this Havana theme engagement party. Paired with crusty empanadas and adorned with fancy swizzle sticks, they’re tempting indeed. For this summertime occasion, think of cocktails such as mojitos served up nice and cold in stem-less wine glasses or in stylish long stem goblets. 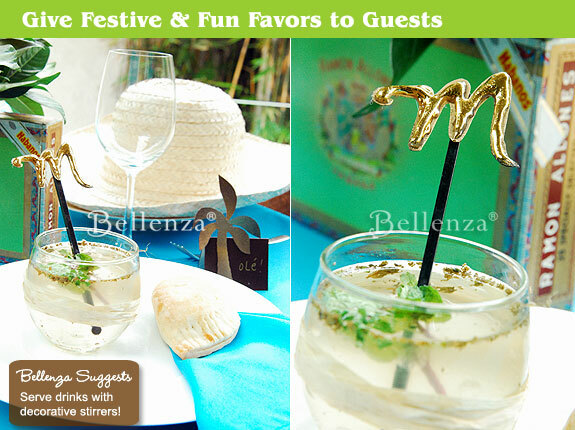 Add a personal twist to the drinks by creating monogrammed swizzle sticks. How? By combining hot silicone glue with gold paint and forming it into a letter—“m” for mojito perhaps, or your own paired initials! Golden-crusted empanadas are a favorite. 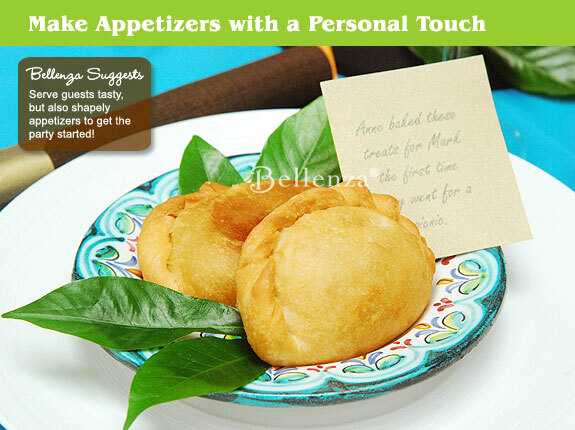 Serve them as filling welcome appetizers or as a scrumptious side dish to the main entrées at the party. Cuba is famed for its rich, meaty dishes. Some main entrée choices for your party, then, could be “Ropa Vieja” (Beef Stew), “Masitas de Puerco” (Fried Pork Tenders), ox tail, or barbecued ribs. For a lighter option, you can serve the popular sandwiches called “sandwich mixto” or Cuban Pressed Sandwiches. These are typical menu items at any Cuban café, and are simply slices of grilled or fried pork with cheese pressed between buttered bread slices and toasted to a crispy golden brown. Create a party ambiance inspired by a “vintage Havana” look set in the 1920s. Plan a chic color motif with browns and beiges as its base, highlighted with accents of aqua, green, and orange. Set a “fashionably casual” dress code for guests to come in summery cocktail dresses and cool linen guayaberas. Decorate the venue with quaint antique store finds and collectibles, and adorn the table display with clever cigar accents and dainty favor sachets. Serve flavorful Cuban-style food and refreshing summer cocktails, with Cuban jazz and dance music in the background. Other favorites you can serve as appetizers are empanadas and tostones. Empanadas are biscuit dough or pastry shells filled with a tasty combo of ground beef, chicken, or turkey mixed with tomato sauce, corn, and grated cheese—then folded over into a crescent shape and crimped along the edges to seal. Tostones are simply plantain slices fried till tender and golden to bring out their natural sweetness. What about Cuban salads? Choose from two classics: Ensalada Cubana and Ensalada de Garbanzo. The first is a typical Cuban salad made with ripe tomato wedges and thinly sliced onions and radishes, served with a dressing of olive oil, vinegar, and lemon juice. The second is made with chick peas or garbanzo beans, tossed with diced green and red peppers and sweet yellow onions in a dressing of fresh lime juice and olive oil, with a hint of cumin. Or you can give your usual green salad a unique kick with the addition of black beans, caramelized onions, and avocado chunks drizzled with a tangy lime vinaigrette. Wondering what to wear? See our post on gorgeous Havana Nights Party Attire. Now for the desserts! Cubans have a natural sweet tooth, so choose from these delectable temptations to round out your party menu. There is flan (Cuban custard) served in individual custard cups and dusted with a little cinnamon or nutmeg, or merenguitos (mini meringues) made from beaten egg whites whipped with sugar and then baked. You also have arroz con leche (rice pudding) flavored with cinnamon and topped with juicy raisins. Then for some pastry or cake options, there are señoritas, pastelitos, and capuchinos. Señoritas are flaky pastries filled with layers of creamy custard, served in a choice of vanilla or chocolate flavors. Pastelitos are little puff pastry “buns” stuffed with your choice of guava or cream cheese fillings, or grated coconut in heavy syrup. And the capuchinos are little yellow cone-shaped cakes, soaked in a syrup made with cinnamon, orange and lemon peels, and anisette. Yum! Hint: If you don’t plan to cook the party fare yourself, you can always use the ideas above as a reference for finding a caterer or restaurant specializing in authentic Cuban dishes. Next Whimsical Favors for a Mad Hatter Tea Party! This is so much fun to plan! Hello there. I was wondering if you know of any Cuban bakery in LA? I am planning a tea party using this theme. Thank you very much for your help. Exactly what I am looking for! I needed the decoration/table setting ideas for a Cuban themed birthday party. The food & drinks are dead on as well! That’s great to hear! We’re absolutely thrilled that your are planning this theme for a birthday party. It’s such a fun theme! Love your ideas for this party! Im helping plan an engagment party for my sister and it’s a cuban theme. We are doing tappas and Mojitos, so exciting! We would love to know how you made those cocktail sticks in detail. His last name starts with an M so these are perfect!!! Thank You so much for your time! Where can I find the party decorations? For the tablecloth, you may want to try the online store of Wisteria which sells a similar color as the one we used. Other places such as Bed Bath & Beyond, Target, Jo Ann Fabrics, or Anna’s Linens may carry them as well. As for the party decorations, many of the items we made ourselves or were sourced and/or borrowed from various places including flea markets and antique shops, including our own stock of items and that of friends. These include the fedora hats, antique fan, and the furniture. If you are looking for used cigar boxes, eBay seems to carry a variety of them. We used bird of paradise flowers as our floral decor. These flowers prefer sunlight for optimum growth so they are best in season during spring or summer. Another option: you may also try bromeliads which come in various hues. I love this theme! I was wondering if the cigar boxes are paper or wood? Also, how did the flowers sit on top of the centerpiece? Or was there a hole to put the stems in? Thank you for your help!! Hi, Chelsea! The cigar boxes are real ones, so they’re made of wood. You could try looking for some sold empty at thrift shops or on eBay. The flowers and leaves were simply bundled together with florist’s wire (which is very thin & pliable), then a bit of excess wire was used to insert in the opening of the cigar box so the arrangement would stay in place. A little tip, though: choose lightweight flowers and leaves, or the boxes may topple over! I love this theme, I’m Cuban and I love the way you create the decorations. I’m having problem finding the old cigar boxes. Do you know of any places in Miami that sell them, or a way of make them? Thank you. Hello, Liudmila — So glad you like the decorations for this party. You can try searching for these old cigar boxes online, especially on eBay. Hope this works out! HI i love this theme, Do you think it will go well on a wedding. I understand this is an engagement party? Hi, Cata! Yes, wedding themes nowadays are quite creative, so you should go with whatever expresses your personality and style as a couple. You could apply this Havana theme maybe with a palette of creamy tones and browns, then choose one bright color to add some “pop” in the floral decorations and place settings (maybe aqua or fuchsia). Happy planning! I love this! Can you tell me where you got the M drink stirrers? I really want these! So glad you like it, Jennifer! The M drink stirrers were made by our stylist from a crafting gel that hardens when dry, then attached to regular plastic swizzle sticks. But if you’d like something ready made, you can check out monogram letters available per piece (you can always spraypaint them to suit your own color scheme). Love the theme. We are planning a big fundraiser for our YMCA. It’s an outside event on the beach with app 550 guest. This year we are planning the theme to be “HAVANA NIGHTS”. We are hoping to dupilicate alot of what we saw on your site! Any suggestions would be great! Would love to hear from you! Hi Susan — We’re thrilled that you find our Havana Nights post helpful for your fundraiser! Having that many guests must be quite a challenge. But it could also make it worth your while to have custom chocolate wafer roll-ups made to look like cigars with “gold seals” bearing your YMCA logo or something. Then, these could be your take-home favors! I am planning a birthday celebration this summer and I am needing ideas for a party with a Art Theme as I am an artist or a Spanish Theme as I am serving Spanish food. It will be a Lunch Party held in the grounds of the Henry Moore Sculpture park. The dress code is what is exercising me the most right now! Hi Mary! Wow, we’d love to see how this party turns out — your venue and theme sound so exciting! To combine the two aspects you mentioned (art and Spanish food), what about having Picasso-inspired decor with a tapas-style menu? Things like the place cards, table numbers, candle holders, coasters, menu cards, napkin rings, etc. could all incorporate Picasso artwork. Then, you could serve a selection of popular tapas dishes (so many great recipes on the web!) on colorful glazed platters. And top everything off with pitchers of ice cold sangria! Have a wonderful party — and share pics if you can. Hello, I am having a Havana Nights Party for my Bridal/Groom shower and I love the decorations on the tables. Can you please let me know where to find the card with the palm trees on it? Hi, Vanessa — Actually, those palm tree cards were handmade by our stylist! The base is just chocolate brown card stock (available at any paper or crafts supply store) and the trees were cut from the same material but then lightly spray-painted gold and glued on. By the way, the idea of having a combined bridal/groom shower sounds great! I ABSOLUTELY LOVE YOUR HAVANA NIGHTS PARTY. MY MOTHER IN LAW WILL BE TURNING 85 THIS YEAR AND I WANT TO SURPRISE HER WITH A REAL AUTHENTIC VINTAGE CUBAN PARTY. I HAVE VARIOUS IDEAS BUT ANY REALLY UNIQUE IDEAS THAT WOULD REALLY STAND OUT WOULD BE APPRECIATED. BECAUSE IT IS HER 85TH, I WANT TO MAKE THIS AS SPECIAL AS POSSIBLE. SHE’S A CLASSY LADY SO I WANT TO ADD SOME FINESSE TO THE PARTY AS WELL. 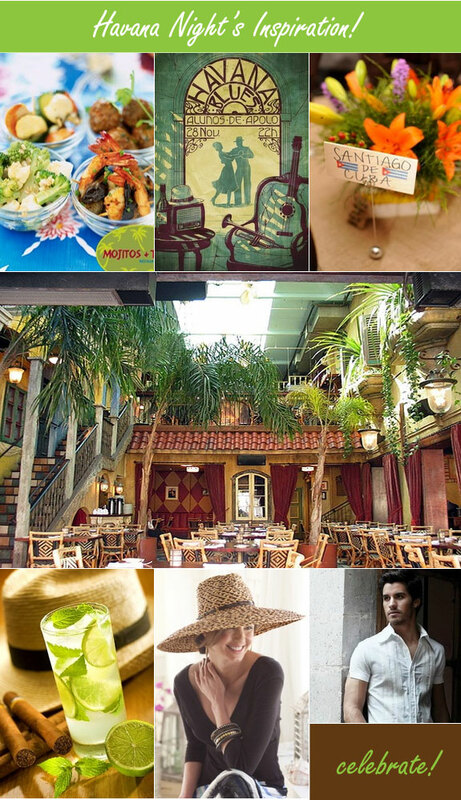 Hi Frances — We’re thrilled that you find our Havana Nights party inspiring! It was lots of fun for us to put together, too. Your plan to surprise your MIL with a vintage Cuban party is fabulous! We did a little research and found out that the “mariposa blanca” (white butterfly) is the national flower of Cuba. Wouldn’t this be a meaningful and elegant focal point for your party? From photos online, you can see what a lovely flower it is! You could also find possible sources where you can buy fresh or silk “mariposa” to decorate with. We’d love for you to share photos of how the party turns out. Happy planning! All of the displayed decorations are just beautiful!! Hello Lucy — So glad you like our Havana-inspired party setting! Quite remarkable, too, that your daughter has decided on this theme for her 15th birthday celebration. Since most of the symbols associated with Cuba seem to be masculine, I did a little research and discovered that the White Mariposa (Butterfly Jasmine) is the national symbol. Wouldn’t this be a lovely image to incorporate into the party invitations, and then to have as small centerpieces on the party tables? Your daughter could still have the Cuban place names to mark each table — maybe as little signs standing in each centerpiece of mariposas! Would love to see how the party turns out, if you could share a photo or two of the decor and table settings! Happy planning. Love you page. I recently hosted a Havana Night party as per your suggestions. It was just great. I purcahsed mosr=t of my decorations from http://www.cubanfoodmarket.comfrom my customized tablecloths to napkins, ballons… the works!! I love these theme and am trying to recreate it for an upcoming birthday party. Can you please give me the details on how you used the cigar box as a vase for the flowers? I’m trying to figure out if you put an actual vase in the box to hold up the flowers or if they are just sitting on top of the cigar box. If you can please let me know i would really appreciate it. Hi Gisela! For our photo shoot, we intentionally chose pretty hardy flowers (bird-of-paradise) and bunches of leaves, which we could just perch on top of the cigar box or else squeeze the stems between the lid and the box bottom. But for more delicate flowers, we suggest using those tiny plastic vials (they look a bit like mini test tubes) that florists use to keep them fresh in transit. They should be small enough to hide inside the box, leaving just the stems and blooms sticking out. Hope this helps! I’m planning to have a Cuban style reception after my wedding and I’m looking for some ideas. I’m looking for the table decorations with Cuban cigars it will be great if you can give me some ideas about that and any ideas that you may have I will appreciated. If you need to reach me please contact me at my e-mail above. Hi Tabatha! We love a Cuban theme, too. For the cigar box centerpieces, our stylist just used empty ones found from thrift stores or you can look for online sources. Then we just dressed these up with flowers and leaves. In fact, you’ll notice that we also created decorative accents that “suggest” Cuba even if they aren’t the real thing! Notice the rolled-up brown napkins with a gold band to look like cigars. The straw hats, the cocktails, and the palm tree place cards! 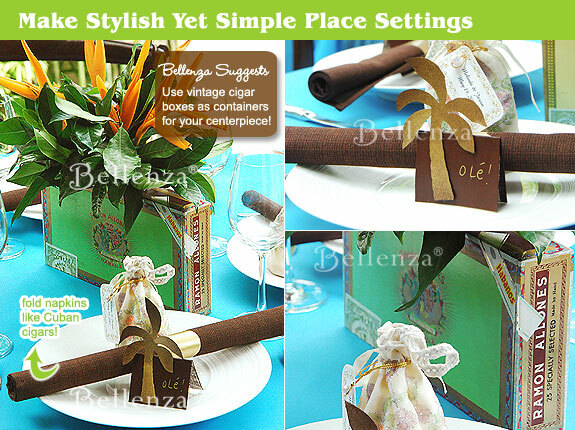 I would like to recreate the cigar box centerpieces from this Havana theme party, but am having a hard time figuring out out the have the box closed with the flower stems inside? Can you help explain how you did that? To insert the flowers into the box, you will have to create a slit in the center of the top section of the box. Then, insert your stems carefully from the top. Hope this helps!